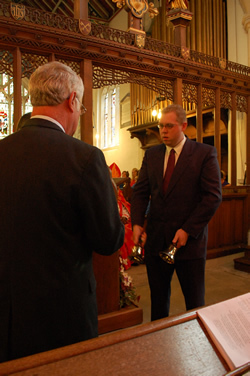 The restoration and augmentation of the bells at All Saints Roos in 2012 was the result of a wonderful effort involving the B & D, ringers from across Yorkshire and beyond, and the local community. The bells are well loved within Roos. We have an established Sunday service band but are keen to ensure that we make provision for the future. Thanks to the ITTS scheme, our teaching of young learners is proving to be very successful. We now have a queue of under 12s waiting for us on Tuesday nights wanting to get the bells up! The Church has strong links with Roos C of E Primary School and so it seemed right that the children should be a part of our decision to augment to eight. Years 5 & 6 enjoyed a fabulous afternoon at Taylor’s Bell Foundry in Loughborough on June 26th. 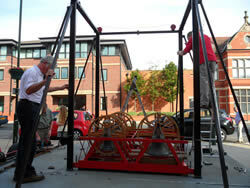 They got to hit bells with mallets, carried a bronze ingot and thanks to James Blackburn and Bill Purvis , watched a demonstration of the Carter Ringing Machine. 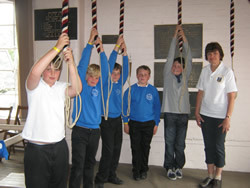 All of the children came up the tower, where our young ringers were able to demonstrate their skills to their classmates. The afternoon culminated in watching the two new trebles for Roos being cast. Coverage by Radio Humberside earlier in the day added to the excitement, and the children were fully aware they were witnessing history in the making. 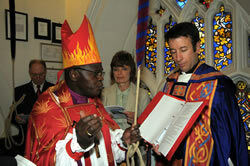 The trip was made possible by financial support from The Archbishop of York’s Mission Fund and the Ann Watson Trust. 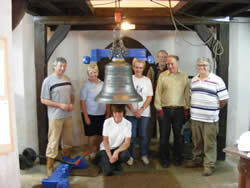 Whites of Appleton Ltd will be installing the new bells at the end of September. The service of dedication conducted by Revd Giles Galley will be on Saturday, November 1st, to which all members are warmly invited. 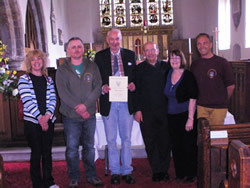 Albert Lowery of Hedon was recently made an honorary life member of the B & D. His fellow ringers at Hedon are proud and delighted for him. Those present at the meeting at Market Weighton will have heard Keith Everingham describe the faithful service Albert has performed ever since learning to ring in 1966. Not only that, he has made boxes and notice boards for other local towers. We at Roos have benefitted from his skill and generosity. Visitors to Hedon should note that Albert has painstakingly re cemented every step up the tower – that is why they are so level. Albert decided that he wanted to mark his Life Membership by ringing a quarter peal on a working bell. He has done this just once before at Hessle in 2003. The band was carefully chosen and Albert duly rang the treble to a quarter of bob doubles on the back six at Hedon – his home tower. This achievement at the age of 81 was celebrated with a glass of wine at the foot of the tower. Congratulations Albert and Well Done. 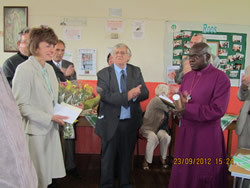 The visit of the Archbishop of York Dr. John Sentamu to conduct our service of dedication and thanksgiving was a wonderful end to our project. 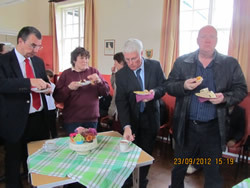 The service was well attended by members of the community and ringers from the B & D and the Yorkshire Association. Readings were given by Rev Giles Galley (Psalm 150) and churchwarden John McWilliams (Philippians 4 v3-7). Helen Audley read the poem Sabbath Bells by John Clare. Children from Roos Primary school sang ‘Jesus’ Love is Very Wonderful’. 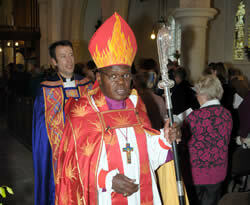 The Archbishop was on good form and gave an amusing address around the subject of Psalm 150. He said that the Roos PCC cannot plead poverty anymore because he now knows we can raise lots of money when we have to! Brian White from Whites of Appleton officially handed the bells over to the churchwardens who asked the Archbishop to bless them. This he did with a great flourish and made a very good job of chiming the new treble. Helen Audley then rang the treble up and members of the Roos Sunday Service Band rang some rounds and call changes on the 6. John Atkinson, James Blackburn and Roddy Horton then rang a course of Bob Minor on handbells which captivated everyone present. The service concluded with some fine well struck ringing from Barrie Dove, Mike Robson, John Atkinson, Andrew Bicknell, James Blackburn and Gary Audley. We then adjourned to the Roos Memorial Institute for a massive afternoon tea prepared by church members, Roos WI and Alan Lavender. 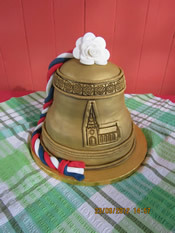 Peter Cook had another bell cake made – similar to the one at the recent B & D meeting at Withernsea. Even the Archbishop took photos of this with his mobile phone! Andrew Bicknell and James Blackburn received a vote of thanks and gifts from the Roos PCC and ringers for all their hard work. Peter Cook presented Helen Audley with a bouquet, card and letter saying that a commemorative tree is to be planted in the churchyard later in the year. Highlights from the proceedings were broadcast on BBC Look North later that evening and the event has been well covered by the local media. It was a truly memorable occasion. On June 25th, Graham Clifton form Whites of Appleton arrived in a heavily laden truck containing the steel girders, the new frame, all our wheels, the 3rd of the 6 to be hung in the new frame…….and OUR NEW TREBLE! 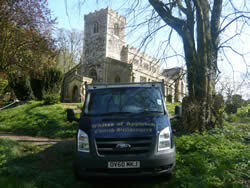 The aforementioned truck then got horribly stuck in the mud in the churchyard, so we unloaded everything apart from the bells, but the truck still had to be towed out. 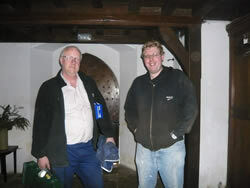 Graham, ably assisted by James Blackburn and Andrew Bicknell masterminded the operation up in the bell room. Gary Audley was also up there with his thumb on the button of the electric hoist. Further down was Peter Cook and the rest of the Roos team were on the ground floor. Mention should be made of PCC member Brian Rannard who came on Monday morning to simply to video us unloading the truck and ended up spending three days working really hard. The Lavender/McWilliams catering corps rose magnificently to the occasion. Roos bell workers never go hungry! Monday evening, the entire team plus partners celebrated bell day with a meal and a few beers at the Hare and Hounds in Burstwick. 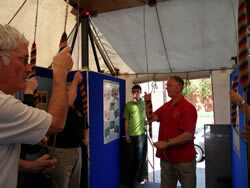 Watching our new bell being raised up the tower on Tuesday was a momentous occasion. Roos is now a 6 bell tower! We are not finished yet as the new girders had to be concreted in. Whites will be back on July19th/20th to finish off. Albert Lowery, a loyal and long serving member of the band at St Augustine's, Hedon recently celebrated his 80th birthday. Albert is a stalwart Sunday Service ringer and readily gives of his time to ring for weddings and to help out at other local towers when needed. He is always on hand to welcome visiting ringers and takes great pride in showing learners and other interested parties up the tower to see the bells. 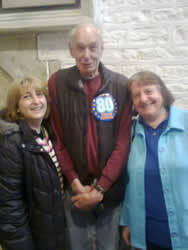 He served for many years as Church Warden and still assists the Church in many paractical ways with quiet good humour. 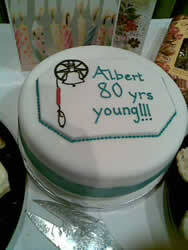 True to form Albert didn't mention his Big Birthday, but a surprise get together was held at Hedon church and was well attended by his ringing friends and fellow church members. 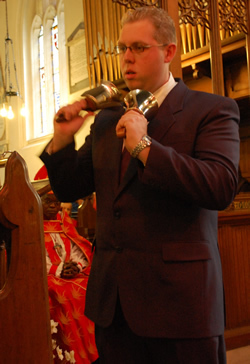 A quarter peal was rung at Patrington to mark the occasion. 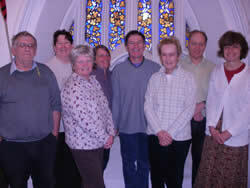 On Sunday April 15th the Roos Sunday Service band rang the 5 for the last time. Following the morning service which consisted of some very fast hymns played by the 3rd reserve scraping the barrel organist (Helen), and an obligingly short sermon from our priest, the dismantling began. Andrew Bicknell and James Blackburn systematically removed the ropes, stays, wheels, clappers, and pulley blocks assisted by the Roos Ringers and aided and abetted by the Lavender/McWilliams Catering Corp. The following morning, Graham Clifton from Whites of Appleton arrived. Gary was promoted to being a ‘top of the tower assistant’ under the instruction of Andrew and Graham. Peter was also on hand. 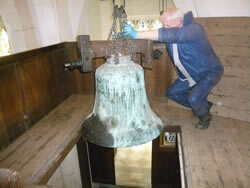 A long day was spent taking off the headstocks from four of the bells and lowering the 2nd. The remains of the old crown staples were removed from the 3rd and 4th. All the fittings have been taken away for refurbishment. It took Graham half a day to clean all the grease from his tools when he got back to Appleton. Meanwhile, Helen and Gill spent a horrible few hours scraping solid lumps of black grease from the bell frame and off the floor, ahead of the builders’ arrival. Kemps of Skirlaugh have cut four pockets in the tower walls and constructed padstones to support the new girders. The next stage is to get the frame cleaned and painted. 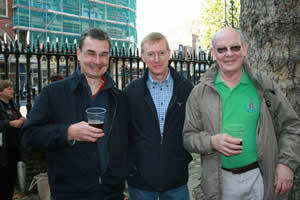 The Roos Ringers and PCC are indebted to Andrew Bicknell and James Blackburn who have been brilliant. Additionally I would personally like to thank the Roos team: Gary Audley, Peter Cook, Gill Dickinson, Diane and Alan Lavender, John and Sue McWilliams, all of whom have worked so hard and given so much. The new treble for All Saints Roos which was cast in November is now finished and ready to leave the Loughborough foundry. Photo kindly provided by J. Taylor & Co. Whites of Appleton Ltd will be installing it later in the year, assisted by a team of volunteers led by Andrew Bicknell and James Blackburn. The Roos ringers are very grateful for all the help and support we are receiving. Roos Bells All Systems Go! 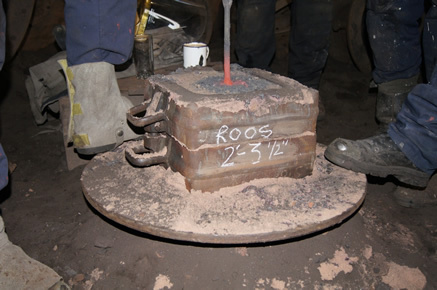 The Roos bell was cast at Taylor’s foundry on November 17th. 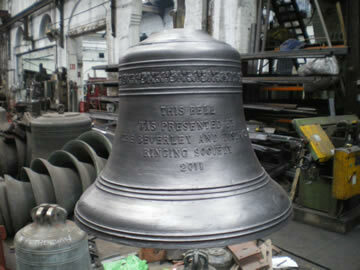 The inscription will read This bell was presented by the Beverley and District Ringing Society” 2011. 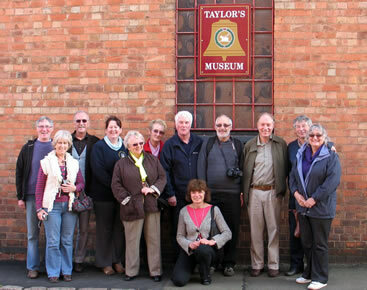 A group of us from Roos and the B & D had a wonderful afternoon at Loughborough enjoying a tour of the museum and foundry before witnessing the casting. Knowing it was our bell made it very special. We held a final major fund raising event in Roos on November 25th. Roos ringer Diane Lavender’s husband Alan who has recently retired after working for 25 years as head chef at Chequers generously staged “An Evening with Alan Lavender”. Roos village hall was packed to bursting point for the occasion and we were treated to a very entertaining evening of cookery demonstrations interspersed with stories of his working life. Delicious food was served and a good time was had by all. 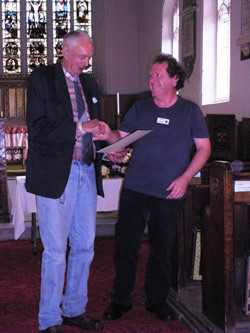 The raffle for the watercolour of Roos church was drawn and won by Pat Hardy of Roos. B & D member Gail Horton was the lucky winner of an Alan Lavender Christmas pudding. There were other lesser prizes. Including the raffle and sales of prints, the evening raised nearly £1400. Thank you to everyone who bought tickets. So in almost exactly one year, nearly £47,000 has been raised. The B & D should feel very proud because this would not have happened without the BRF and the support and encouragement of so many members. Thank you from all of us at Roos. Now for stage 2! Whites of Appleton start work on April 16th. 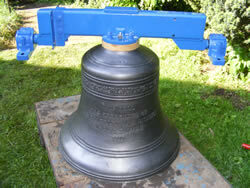 If you are ready/willing and able to assist the bell hanger in dismantling the bells, or would be prepared to help with cleaning and painting the frame, or could assist in the reassembly which we anticipate will be in early June we would be delighted if you would get in touch. The London 12-bell competition has only run for 3 years and this year was hosted by the Society of Royal Cumberland Youths at Shoreditch on Saturday 22nd October 2011. It is a credit to the BnD that a quarter of the winning team is made up of past masters and the photo shows Roddy and Ian enjoying one of several beers after the competition with David being abstemious as he had work to do. Following the successful exhibition at the Treasure House in Beverley the following article appeared in the Ringing World, penned by our PRO Roasina Baxter. At a Beverley & District Ringing Society Committee Meeting towards the end of 2009, one of the agenda items was “presentation of the B&D”. Little did we know then what the ensuing discussion on promoting ringing and the work of the Society in East Yorkshire would lead to! One of our members was then working for the East Yorkshire Museums Service and mentioned that the Treasure House in Beverley had exhibition space which might be available for our use. The Treasure House is owned by the East Riding of Yorkshire Council and is home to the Museums, Archives and Local Studies Services, Beverley Art Gallery and Beverley Library. The treasures of the East Riding are presented through local history and art exhibitions. After a telephone call and several meetings with the wonderful Beverley Curator, the Society put on a poster exhibition in the archive corridor of the Treasure House. This was entitled “Bells & Bellringing in East Yorkshire” and consisted of six A1 panels written and illustrated by Society members and prepared and printed by Treasure House staff. These were on display in May & June 2010. After the exhibition ended the Society was given the panels, which have been displayed at several church and tower open days in the area and are available for B&D Society members to borrow. The exhibition was very well received and we were invited to put on a larger display in Gallery Two - an exhibition space on the first floor of the Treasure House alongside the café and leading to the art gallery. The exhibition area is 26 linear metres of hanging space together with 3 large display cases – a lot of space to fill. The Beverley Town Handbell Ringers, celebrating their 30th anniversary in 2011, joined us and provided a lot of material and a set of shiny new handbells for the exhibition. I went round towers in the area and borrowed anything that wasn’t nailed down – a model bell, a peal board, a bell rope, a clapper (not in use at the time! ), photographs, certificates, trophies and peal books. The Bells Ring Out! exhibition opened in the Treasure House on 25 June 2011, which co-incided with the Church and Tower Open Day at St Mary’s, Beverley, and was available for viewing during the Treasure House opening hours, six days a week until 10 September. Publicity was arranged by the Treasure House who provided posters and flyers at their expense, put out a press release to local papers and arranged an interview with two of the St Mary’s ringers on local BBC radio the day before the exhibition opened. The exhibition was very well received and, at our meeting in early July, the Society’s Committee agreed to provide the funding to hire a mini-ring for a day to enable members of the public to see ringing being done and perhaps have a try themselves. 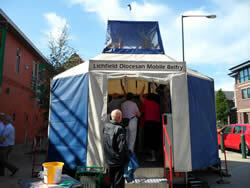 After lots of questions from the powers that be, permission was obtained to site a mini-ring on the paved area in front of the Treasure House, and the Lichfield Diocesan Mobile Belfry was booked for 3rd September to coincide with drop-in handbell workshops being run by the Beverley Town Handbell Ringers in the Treasure House that day. Saturday 3rd September started early for the writer who was at BBC Radio Humberside studios in Hull at 07.00 for a live interview about bellringing on the early morning programme at 07.18. It was an even earlier start for John Daubner, who towed the trailer carrying the mobile belfry to Beverley, arriving at the Treasure House before 08.00 and then assembled the belfry, assisted by a team of local ringers, of varying ages and technical abilities. 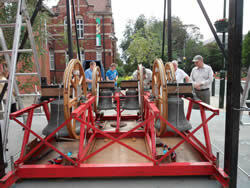 By about 10.45 all was in place and the bells were ready to be rung. They proved challenging to handle at first because of their light weight but, after a bit of practice, most of the ringers got the hang of them and we went on to ring some good touches of Surprise Minor, Stedman and Original as well as Plain Bob, Grandsire and lots of Rounds and Call Changes. Society members came and went during the day, many of them fitting ringing on the mobile belfry around wedding ringing at their own towers. There was ringing for one wedding at Beverly St Mary and two weddings at Beverley Minster that day, so members of the public had the chance to hear church bells being rung as well as to see and hear the bells of the mobile belfry,. It was quite an experience for some of the ringers to go from rings of ten with 34cwt or 42cwt tenors to a ring of six with a 76.5lb tenor! The bells were rung until just before 4 o’clock in the afternoon, when the Treasure House closed, attracting a steady stream of visitors during the day. The belfry took much less time to dismantle than it did to assemble and all those involved then went home or in search of liquid refreshment feeling it had been a very worthwhile (but tiring!) day. After the end of the exhibition at the Treasure House, the Museums Service is taking the panels on tour, to be exhibited at various places such as stately homes and churches in East Yorkshire. Following that, they will be available for the Society to use. 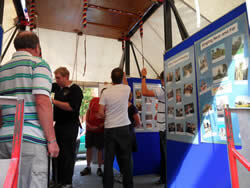 The exhibition and associated activities have certainly raised the profile of bellringing in the East Yorkshire area. 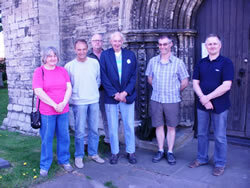 The support we received from the Treasure House staff, in particular the Beverley Curator, Alison Brice, was fantastic. If other societies are looking to put on exhibitions to promote bellringing, we recommend contacting your local library and museums service to see what they can offer. The Roos ringers would like to say a huge thank you to everyone who sponsored us for our 25 mile walk on July 9th. The amount raised including the sum we can claim through the gift aid scheme looks set to be approaching £2000 which is incredible. 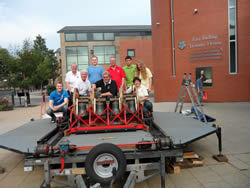 It was a great team effort by B & D members who have been so generous with their time. Sarah Dawson organised the walk (The High Hunsley Circuit). 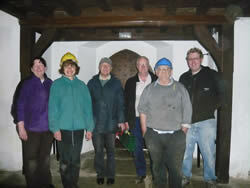 Practical support on the day was given by Ann Hughes, James Blackburn, Sue McWilliams and her husband John. We couldn’t have done it without their supplies of delicious food and cups of tea delivered with unfailing cheerfulness and lots of encouragement. Not pictured. Wendy Stabler who joined us for 7 miles. This takes our total to over £35,000. We are getting there! Thank you. See the latest news on youtube!